We have all heard the cautionary tale of the three little pigs, haven’t we? If not, then this next slot won’t make much sense, because it is loosely based on that theme. Thanks to Microgaming we all get to relive the childhood tale but with a grown up twist, winning money! 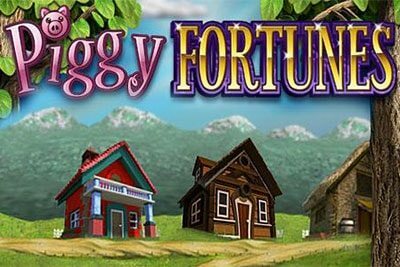 Piggy Fortunes is going to certainly evoke some memories for players, but will it bring along some jackpots too? 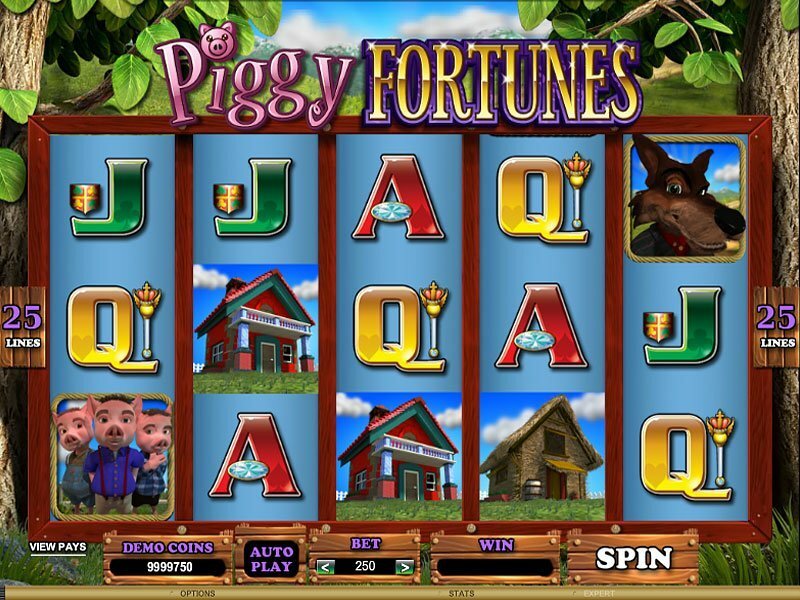 Piggy Fortunes is a 5-reel, 25 pay line slot offering a huff and puff RTP of 96% for all you greedy wolves knocking at the piggy’s doors. Overall the game is quite animated in design with almost 3d like characters on the reels, who come to life a little and there’s even the three houses! Music is a bit of a letdown for us as it doesn’t really sit well with the theme of the game, but its easy enough to switch off so that’s our best advice. Bet Amounts – Betting begins at 25p per spin and can be increased to a maximum of just £3.75 per spin. Making Piggy Fortunes one of our all time lowest costing games, meaning affordable for all. Whether you have a small balance or are looking to play a sustainable length of time, this will be for you. Wild Symbol – Your wild symbol on Piggy Fortunes is of course the big bad wolf and he will substitute for all other symbols except for the scatter. He also plays a vital role in the scatter triggered feature game, so read on to find out more about that. Scatter Symbols – The three little pigs are your scatter symbol and landing three or more of these will trigger the bonus feature. They are also your highest paying symbol in Piggy Fortunes and depending on your stake amount will pay out between x2,500 coins and x37,500 coins for landing x5 on a winning line. A brick house will award a x4 multiplier. The big bad wolf bonus cannot be retriggered from within the round which isn’t great. But, if you manage to rebuild those blown down houses you are in with a chance of extending the number of spins you get. Whilst the premise of the game suggested a fun and quirky play, the reality was that it got boring very quick. Wins did come fairly often but always on the lower end of the scale, which when you compare to the cost of play can be justified. However, the bonus game does take a while to trigger and although when it does you can win bigger, it just got tiresome after a while. It does have mixed reviews overall with some players loving the game and others not so much, so it really is just up to you to decide for yourself. As for us, it was a great time filler but wasn’t something we would spend too much time or money on in future.